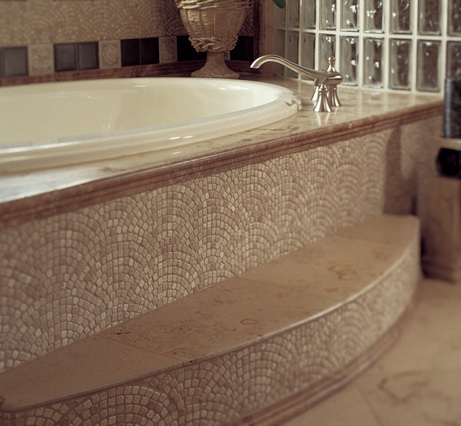 ​Ceramic Tile -- Old yet contemporary, today's choices will amaze you. Beautiful on the wall, too -- a Tee's Flooring specialty! Ceramic is dynamic. Its unique character, texture and nature-made material add energy, excitement and enchantment to any room. Its multitude of styles, shapes, patterns, colors and finishes can take your environment from elegant and quiet to vibrant and provocative. 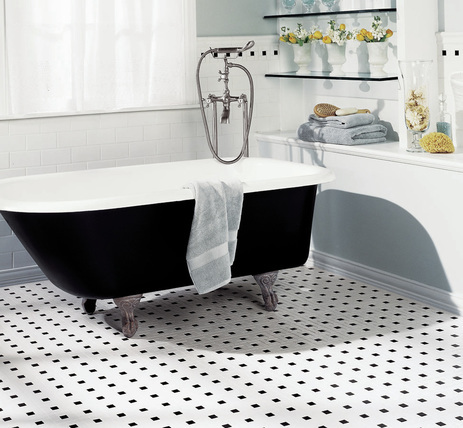 What is ceramic tile vs. porcelain tile? This is a bit of a trick question. 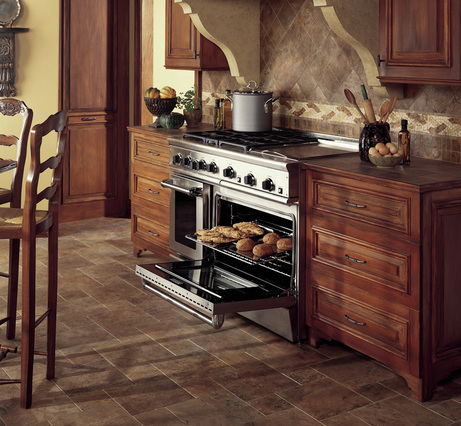 Ceramic tile is made from clay or a mixture of clay and other materials, then kiln-fired. 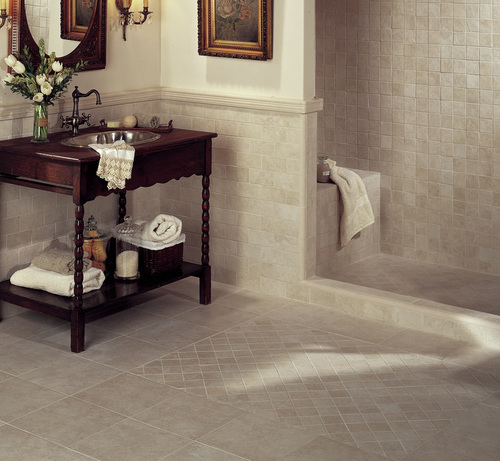 There two distinct types of ceramic tile, and those are "porcelain" and "non-porcelain." Tile terminology can be confusing because both porcelain and non-porcelain tiles are part of the larger "ceramic tile" classification. However, in the industry "ceramic tile" is often used to refer specifically to non-porcelain tile. So if you hear the question, "Do you want porcelain or ceramic tile?" that really means, "Do you want porcelain or non-porcelain tile?" 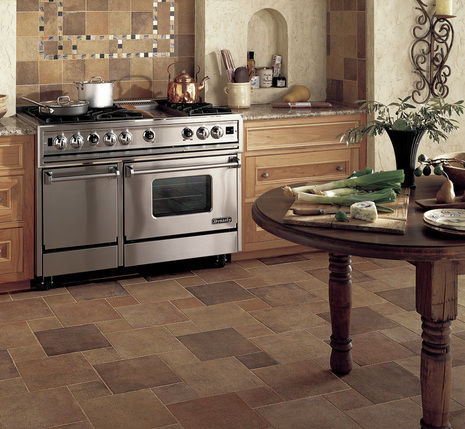 Non-porcelain tiles are generally made from red or white clay fired in a kiln. They are almost always finished with a durable glaze which carries the color and pattern. These tiles are used in both wall tile and floor tile applications, are softer and easier to cut than porcelain, and usually carry a PEI 0 to 3 rating. Non-porcelain ceramic tiles are usually suitable for very light to moderate traffic and usually have a higher water absorption rating. This makes them less frost resistant and more prone to wear and chipping than porcelain tiles. Porcelain tile is generally dust pressed from porcelain clays, resulting in a dense, impervious, fine grained, smooth tile with a sharply formed face. Porcelain tiles usually have a much lower water absorption rate (less than 0.5%) than non-porcelain tiles making them frost resistant or frost-proof. Glazed porcelain tiles are much harder and more wear and damage resistant than non-porcelain ceramic tiles. This makes them suitable for any application from light traffic to the heaviest residential or light commercial traffic. Full body porcelain tiles carry the color and pattern through the entire thickness of the tile making them virtually impervious to wear and are suitable for any application from residential to the highest traffic commercial or industrial applications. ​Porcelain tiles are available in matte, unglazed or a high polished finish. Class 3 – Light to Moderate Traffic: Any residential area with the possible exception of some entries and kitchens if extremely heavy or abrasive traffic is anticipated. Class 4 – Moderate to Heavy Traffic: High traffic areas subject to abrasion or tracked-in dirt; e.g., residential entry, kitchen, balcony, or countertops. Class 5 – Heavy Traffic: Suggested for residential, commercial and institutional floor subjected to heavy traffic. What's the difference between glazed and full-body tile? Glazed tiles are coated with a liquid glass, which is then baked into the surface of the clay. 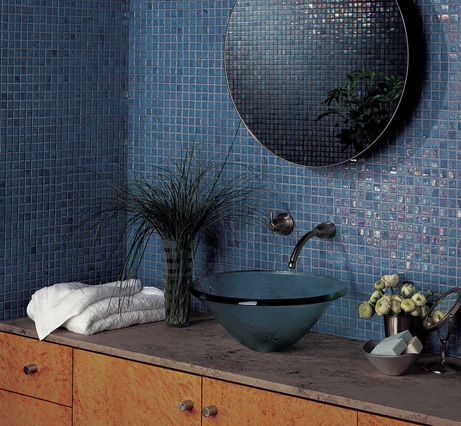 The glaze provides an unlimited array of colors and designs and protects the tile from staining. Unglazed tile is basically the same as glazed tile, but has an uncoated surface. Full-body porcelain tiles do not show wear because their color extends throughout the tile, making them ideal for commercial applications. You may put a penetrating sealer on your unglazed tile or your grout joints. Penetrating sealer is an invisible, stain resistant shield that is absorbed into the surface. Glazed tile is already stain proof, so there is no purpose to adding a sealer. If your room is small, use larger squares (13×13) to create a more open appearance with fewer grout lines to break up the space. Use a grout color that is slightly darker than your tile to reduce the appearance of grout soiling. This is especially true in high-traffic areas.